Ensemble. Photo courtesy Oregon Shakespeare Festival. One of the advantages theatre has over film is its power to convince the audience of visual metaphor. If a special effect looks cheesy in a movie, it is noticeable, but in a play using ribbons for water or dancers for wind is not only acceptable but elegant. 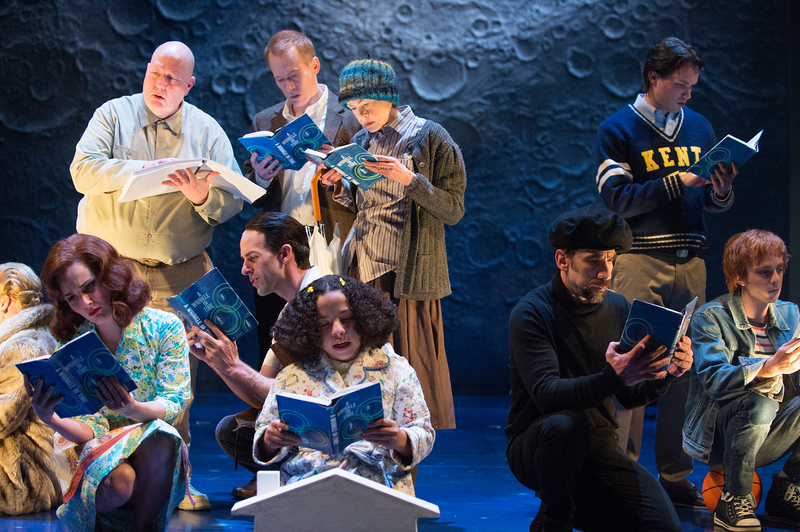 OSF’s adaptation of the Madame L’Engle children’s novel deftly translates the “magical science” to the stage in beautiful way that could only work on stage. A multitude of performance arts are used in the adaptation, including stage magic, ventriloquism, and dance, and unusual props (such as a meteor-shaped disco ball) are combined with A/V special effects to create an experience that doesn’t betray the sense of wonder conveyed by the text. A lot of theatre, especially high budget theatre, is too reliant on stage gimmicks; however, because this is an adaptation of A Wrinkle In Time, the effects only serve as a more faithful adaptation. After all, what could be more faithful than sparking an interest in sets and stage mechanics? The main trio of Meg, Charles Wallace, and Calvin were played by Alejandra Escalante (Juliet from 2012’s Romeo and Juliet), Sara Bruner, and Joe Wegner respectively; their performances cut to the core of their characters as children who have outgrown their numerical age. The Murry children especially possess the emotional maturity to be expected from their age (including Charles Wallace’s posing at a greater level of maturity) but never lose their intellectual talent and curiosity. My favorite supporting actor was the graceful Dan Donohue as the archetypal physicist dad Mr. Murry. A Wrinkle In Time is designed for children and children-at-heart; it often relies more on visual wonder than metaphorical complexity. However, this is the kind of theatre keeps art alive by igniting a love of theatre in a new generation, and I am proud of OSF for creating it.